25.7.15 - The revised club grades are published. Grades are based on results up to 30th June 2015. They are not written in stone. Corrections may be made at any time, both to game results and to players' details, as errors come to light. They are based on games played up to 31st Dec 2015. For detailed guidance on using the list, see the new ECF Grading website. I am sorry to have to let you know that my father, Arthur Mushens, died late on Saturday 20th June. He had been unwell for some time. The funeral, which will be a requiem Mass, is next Friday, 10th, at 12 noon in the chapel at Nazareth House, Durnford Street, Plymouth. PL1 3QR, followed by a Commital at the Weston Mill, Plymouth crematorium at 2pm. He greatly enjoyed reading your emails and reminiscences on the occasion of his 80th birthday. Any donations should be sent to the RAF Benevolent Fund. I don't know about flowers. With best wishes and thanks for your friendship with my father. Cowley Chess Club invites you to its 2015 Summer Blitz Tournament, which will be held on Monday 22 June at Cowley Chess Club (at Rose Hill Methodist Church in the Main Hall downstairs), with Round 1 beginning at 7.15 pm sharp. All chessplayers are welcome. During the evening we expect again to be hosting the presentation of this season's OCA team trophies and the individual medals for the best performances in the League. As usual, there will be ten games in the Blitz (five rounds playing games with both colours, with five minutes sharpper player per game). A cash prize will be available for the tournament winner, and lots of other prizes of books, etc., including grading prizes, prizes for juniors in various age groups, for the best slow starter, etc. See Cowley Chess Club website for more information and entry details. 27.5.15 - To start with Pavel was looking for a FIDE rated tournament somewhere close by and didn’t even consider this congress until Alan (special thanks as he also gave him a lift to the venue the first two days!) mentioned it at the Witney Chess Club annual dinner. After little consideration we decided to enter very last minute and it turn out to be a very good decision – Pavel went on to win it out-right! What a top performance and everyone at the event was impressed by the way he took challenge after challenge. This was Pavel’s first OPEN tournament title since he started playing in open tournaments some less than year and a half ago – I hope it is just the beginning! Please join me in wishing him more success in his future endeavours! The evening was open to all Oxfordshire players and was well attended. 30.9.14 - The British Chess Educational Trust (BCET) has very generously made Witney Chess Club an award of a fine wooden chess board and set as well as a digital clock in recognition of our efforts on behalf of junior chess. Download the submission we made to the BCET, which you may find of interest. Many thanks in particular to John Wickham, chairman of the BCET trustees. 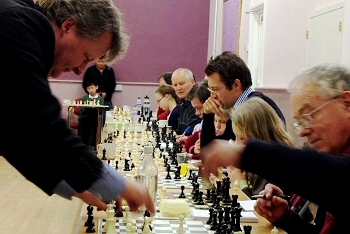 29.9.14 - The 2014 Witney Rapidplay was held on Sunday 28 September at The Batt School, Witney with 3 sections, senior, Junior (Major) and Junior (Minor). 30 mins per game (15 mins per game in the Junior Minor section, in which two games per round with alternating colours were played). A big thank you to the players, arbiters, visitors, prize-winners and organisers. 19.6.14 - Zoe Varney of Cumnor Chess Club is playing in the U15 girls section of the European Schools Chess Championships. Also playing is Marianne Hauer and Elizaveta Sheremetyeva from Witney Chess Club. Read about their exploits in a daily blog courtesy of Andrew Varney. 26.5.14 - Our successful 2013/14 season was celebrated in fine style at our annual club dinner on May 2nd at Hackett's. Prizes were awarded, hands clapped, happy faces were seen, photos taken and even a speech was recorded for posterity! Several photos here from Asen. 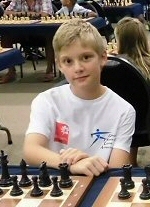 26.5.14 - Here is report on Pavel's first International tournament with the National Chess Junior Squad. Pavel (pictured below) had a flying start that gave him the lead after 5 rounds. In the next round he had a bad game against the eventual winner of the tournament only to bounce back and win the game after - listed below. That led to an exciting last round of the tournament with a few players fighting for the top places. A win would have given Pavel the second place. He unfortunately lost and finished 7th overall and 4th on points. Very admirable result indeed! Read the official report at the National Chess Junior Squad web site. See this link to the top 3 games at each round - some quite interesting. And this link to organiser's picture gallery. On the 15th April I went on a national junior chess squad trip to Frydek-Mistek, Czech Republic. We departed around 5:30 pm and by the time we got there it was about quarter to eight (English time). there it is one hour ahead so the time there was quarter to nine. We had a half an hour bus journey to the hotel in Frydek (we landed in Ostrava), and then had a late supper. The first day we were all tourists, and we explored an old mine, followed by going to the top of a tall tower in Ostrava. See photos below taken from the top of that tower. We went to bed early to have a good rest before the following days games. I was fifth seed in the tournament, out of around 60 people and first round I was paired against a high thirteen hundred. I was hoping it shouldn't be too hard to win as I was white, but I knew not to underestimate. Lucky for me my opponent blundered a piece on move 8 and I won the game. Here is one of my nice games which I won with white - this was a difficult game as I was coming back after I lost to the current leader. Here are some photos I took. Boards 1,2,3 were on the stage and live online. I was leading the tournament for a few rounds, then joint, however after losing one game I had to win my last round game to come 2nd, unfortunately I lost. 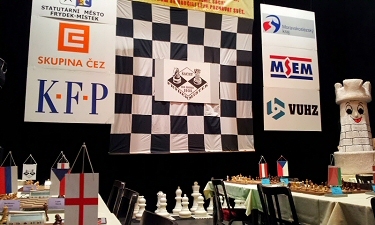 Overall it was a great experience, and good preparation for the 2014 European Youth Chess Championship. 24.5.14 - Cowley Chess Club invites you to its 2014 Summer Blitz Tournament, to be held on Monday 23 June at Cowley Chess Club (at Rose Hill Methodist Church in the Main Hall downstairs), with Round 1 beginning at 7.15 pm sharp. All chessplayers are welcome. During the evening we shall also be hosting the presentation of this season's OCA team trophies and the individual medals for the best performances in the League. As usual, there will be ten games in the Blitz (five rounds playing games with both colours). A cash prize will be available for the tournament winner, and lots of other prizes of books, etc., including grading prizes, prizes for juniors in various age groups, for the best slow starter, etc. 08.5.14 - We had another great weekend of chess at the final weekend of the 4NCL National Chess League at the Puma Daventry Court hotel. After winning all three of our matches over the weekend we pulled ourselves up to mid-table respectability with five wins and two losses out of seven matches played (we missed two weekends because of player shortages), a much better result than our tireless captain David feared at one stage. So we face next season in good heart. If you would like to play in some of the matches next season please let David or me know. 27.4.14 - Bad news I’m afraid – apparently the squirrels have been at it again and chewed their way through the mains cables. So the village hall has to be shut until such time as an electrician can get things sorted out. Last time this happened it took three or four days to sort out, so we should be OK again for the following Monday. If not I’ll let you know. As far as I can see there are no home chess matches tomorrow. The only match which may be relevant is the rearranged Witney 5 - Cowley Workers 2 match from earlier in the season. 27.4.14 - Patrick’s Powerpoint slide gives a light-hearted but interesting perspective on Witney CC’s progress over the last decade or so. Witney 1: Div 1 champions. Witney 2: Promoted to Div 1 and Frank Wood Shield semi-finalists. Witney 3: 3rd place in Div 3. Witney 4: Promoted to Div 3. Witney 5: Two match wins and two match draws in their debut season. 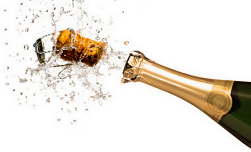 Quite a few achievements to celebrate at our annual club dinner on Friday 2 May! Witney 1 has retained the 1st division title of the Oxfordshire League with a run of 11 straight victories. Only City 1 came close — but Witney won both head-to-heads — leaving no room for argument. As a bonus for Witney, their second team has pipped Didcot 1 to the second division title and promotion to Division 1. 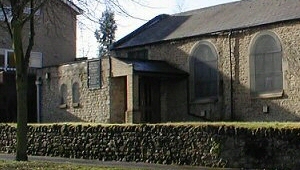 Witney also hold congresses, host lecture evenings and simultaneous displays at their Ducklington Village Hall venue and have a thriving junior scene. 11.4.14 - The first weekend of April marks the National Junior Chess Squad Championships. This has become an open for all juniors to attempt to either qualify for the England Squad or to test themselves in a highly competitive environment with other England Squad players. The event is run by Peter Purland the Manager of the National Junior Squad. The event is a growing success, held in Daventry at the same venue as 4NCL. In total there was over 150 players competing. In the U14s there were 30. Witney had an excellent representation with three juniors: Jake Holton, Marianne Hauer and Elizaveta Sheremetyeva. It was excellent to see Witney providing 50% of the girls in the U14. All the Witney players managed to return a tournament performance higher than their grade. Well done to all in a difficult competition. In the end Jake managed to end joint winner, unbeaten on 4/5, as the U14 National Junior Squad Champion and also £100 richer. The results can be found here. Below is Jake's annotated round 2 game. 10.4.14 - Unbelievable, after 3 years as runners-up, Witney 2 finally came first in division 2. But what a tense evening for all concerned. Everyone got off to a good start and all games were evenly balanced. Paul was first to finish on board 1, with a position still dynamic and with many possibilities of either improving or choosing the wrong course, both players agreed a draw. Round 7, 22.3.14 - Witney won their first match in this season's 4NCL on Sat 22 March. Huzzah! Well done to our juniors in scoring 1½/3, leaving it to the greybeards (Rich, Alan and me) to bring home the bacon. Match cards and round 7/8 games below - Mike. Round 8, 23.3.14 - Witney won again to makes it two wins out of two on weekend 4 of the 4NCL. So an encouraging performance, with everyone playing hard for the team. We scored 6/6 on the top three boards over the two days! - Mike. 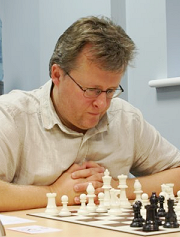 29.3.14 - Matt Rose, chess reporter for the Oxford Times and one of Oxfordshire's finest players, reports on Peter Wells' recent simultaneous display. 28.3.14 - Another Monday, another match at Cowley. The heating seemed even more erratic than usual - artic before Gentleman Gerard's intervention, tropical thereafter, and finally back to arctic once the Rose Hill Methodist Church Hall timers kicked in. Apart from that, a highly satisfactory win against a strong Cowley 1 team. 11.3.14 - So it was back to the league the following evening away at Wantage. The first to finish was Danny who won a piece against George causing immediate resignation. Witney 2 vs. Oxford City 1 and Witney 2 vs. Cowley 3 recent reports, also here. 20.3.14 - The first to finish was Bill who could not repulse a strong attack on his king although he had attacking chances himself. Paul and Jon had creditable draws against stronger opponents. 11.3.14 - Many thanks to Peter for not only providing great entertainment for the largest attendance we have had for an event of this kind but also for his unfailing generosity throughout the evening (giving players the chance to play a second game if they lost quickly, letting players retract blunders, allowing players to pass on their moves, putting the juniors in particular at their ease, and so on) - and also of course many thanks to Tim and Alan for setting up and clearing away, and to Faith for the usual excellent refreshments. No fewer than 33 players in total participated, 14 of them juniors. Despite the throng, my moment of panic at around 5pm when I suddenly realised we might not have enough sets and boards proved entirely unfounded, Alan and Tim having raided the club's storeroom for some of our older kit that I had entirely forgotten about. Despite the occasionally boisterous atmosphere Peter kept his composure admirably well, eventually completing more than 40 games including the numerous second games. The roll of honour comprised wins by Witney's Csaba Koszta, who Peter tells me played a good game throughout, and by Cumnor's Gareth Stevens (a particularly attractive finish this, with Gareth finding a fiendish checkmate completely out of the blue despite a couple of pawns' deficit), together with six draws for Catalin Viscu (Cowley), Simon Terrington (Cumnor), Phil Neatherway and Witney's own Matt Coburn and juniors Pavel Asenov and Jake Holton. Based on the favourable feedback received this is definitely an event that we will be repeating next season. Many thanks to everyone for making the evening such a success. And we broke even as well! Quote of the evening (needless to say from a junior): "Did you have a good time?" "It was OK - the biscuits were the best bit". 09.3.14 - The latest results and games are now online following the completion of round 5. 09.3.14 - The first anxiety was that our board 6 didn't arrive but luckily Tim was able to step into the breach. First to finish was Joshua who won comprehensively. Maxim lost but Bill had a fine win and when Tim was able to checkmate his opponent we were 3-1 up, a draw guaranteed. 07.3.14 - A convincing enough win against Banbury 1, as pleasant a bunch of chaps as you could hope to meet and thoroughly sporting losers. Dave played Witney 1's new secret weapon 9. ...... d5 in the Lowenthal Sicilian and got a winning position against Gary ... read more. 06.3.14 - A very good win which leaves us with the rather scary prospect of promotion if we don’t slip up in our last two games. Bob was first to finish, in a game he’d probably rather forget. Something went badly wrong but I didn’t see what. 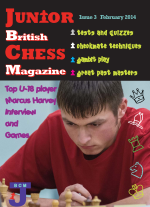 From JBCM Issue 3 p.85 - 17 year old Marcus Harvey, from Oxfordshire, is currently the top under- 18 player in England. 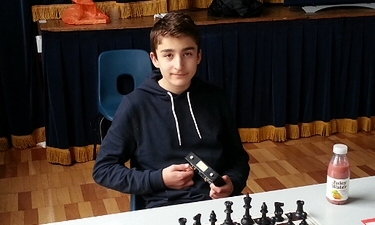 Even at the age of 14 Marcus was already making headline news when he won the 2011 Kidlington Open Tournament, beating two previous winners and a chess master along the way, and achieving a stunning grading performance of 247 – comparable with some of the top players in the country. Marcus has claimed many notable scalps over the board and has notched up success after success on the chess scene (see below). Most recently at the e2e4 tournament in September 2013 he tied for second place on 4/5 with two Grandmasters, two International Masters and a FIDE Master, and in October 2013 Marcus achieved 5/5 in the e2e4 tournament in Wycombe where he beat another International Master and two FIDE Masters, and achieved a very high FIDE rating performance of over 2900. Great performances! 24.2.14 - The Yateley Manor Closed Championships (which are restricted to squad players and those who already have a half norm) saw five players gain there second half norm including a brother and sister. I am pretty certain this is the first time that two from the same family have got in at the same time. The players were; Under 16 Michael Green; Under 14 Emily Green, Matthew Forster, Jake Holton and Oscar Idle. Also interesting that three players got their first half at London Junior (our previous qualifier) and the other two from the British Rapidplay - the qualifier before London Junior. They worked quickly! We would like to welcome six new members who qualified at the London Under 14 Major. This was a very good result and two of the players were U12. We wish them every success in their chess and hope to see them in many events:- James Golding, Rishul Karia, Elizaveta Sheremetyeva, Alex Van Lint, Daniel Varney and Naomi Wei. Zoe Varney and Haotian Wu gained half norms.At the London U12\16 there were 6 more new qualifiers. Zoe Varney; Anshu Ramaiya, Oscar Pollack, Thomas McLaren, Freddie Coleman and Pranav Chauhan. All of these are very welcome new members and we hope to see them regularly during the year.Matthew Forster. Michael Green, Alex Davies and Oscar Idle gained half norms. The Kidlington Congress was, as usual, an excellent tournament. Jake was playing in the U180 - only beaten in the final round by last years winner Nick Burrows. Unfortunately, four draws was little hard on what was overall a decent performance. Pav in the U225 managed 1½ in a series of close matches. Elizaveta scored 3½ in the U120. Results here.